That is exactly what happened to the hot water heater I have pictured here. (Pictured above, right tank) The hot water heater was made back in 1984. This hot water heater was to a townhouse flip I did for a friend of mine. I told her she needed to plan on changing the unit out because of it’s age. It was something like 8 months later I got the call the water in the tank was leaking out and luckily only caused a little damage since it faced a parking area. Although a neighbor of hers, a few months earlier, in an adjacent building wasn’t so lucky. The neighbors hot water heater was located on the second story balcony in a closet. When this tank decided to let go, it not only caused water damage to her upstairs condo, but caused a lot of water damage to the lower first floor condo. What I found interesting was the upstairs condo’s homeowners insurance would not cover the lower condo’s damages, even though the damage was caused but the upstairs unit’s hot water heater! My only advice is if you live where this could possibly happen to you, become friends with your neighbor upstairs and have them check the manufactures date on there hot water heater. Also check your homeowners insurance to see if it covers a situation such as this. If your Manufactures Date is less than 10 years old you you can prolong the life of the tank by simply maintaining it, by draining the tank once a year. The reason for this is; deposits of minerals, calcium, and tiny rocks build up in the bottom of the tank, which speed up the process for the tank to rust out and leak out all of the water. Hence, total failure of your hot water heater. You can either do the draining of your tank, or have a plumber show you how to do it. First you need to look on the tank itself. If you have a gas hot water heater tank, turn off the gas shutoff valve to the tank, according to the manufacture’s sticker on the side of the tank. If you have an electric hot water heater, either shut off the switch, pull the plug, or flip the breaker off going to the hot water heater, according to the manufacture’s sticker on the side of the tank. On the top of the tank there should be a water shutoff valve going into the top of the water heater tank. (Pictured above) If it doesn’t have a shut-off valve at the top of the tank, one should be installed. On most tanks there is a hose bib to connect a garden hose to. (Pictured above) Get your garden hose and screw it onto the hose bib. Stretch the hose out as straight as possible to a location you don’t mind getting wet, like your lawn. Next turn the valve counter-clockwise to open the valve. This should open the valve and release the water. Once the water starts flowing out with good pressure, reach up on top of the tank and shut off the water valve. This will slow the amount of water coming out of the hose. Next find the Temperature & Pressure (T&P) Valve. It is usually located near the top of the tank, and connected to a copper pipe that flows to the outside of the house. (pictured below) If you lift this valve open, you will hear it pulling air into the tank. Leave this valve in the open position until the tank has completely emptied out all the water. This may take some time. Once the tank is empty, I like to turn on the shut-off valve at the top of the tank for about 30 seconds to rinse out the remaining debris in the bottom of the tank. Let that drain out completely. Next shut off the hose bib valve clockwise til it stops, and disconnect the hose. Turn on the valve at the top of the tank completely open, to begin filling the tank back up. You will need to pay attention to the water level as it fills up. You will hear the water filling up and air being pushed out through the (T&P). 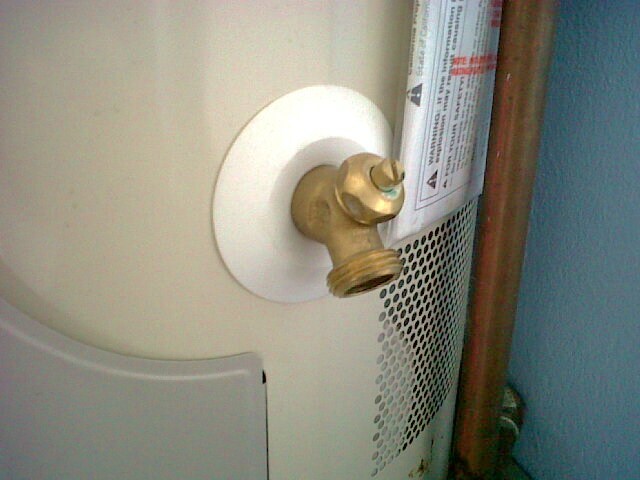 Once the water is pushed out the (T&P) valve to the outside, release the valve so it shuts off. Now go inside to the furthest location away from the hot water heater where you have hot water to turn on to a sink or shower. Turn the hot water side on Only. Be careful to only turn it on a little since the air may spray the water out onto you. Once you think the air bubbles are gone, turn on the Hot & Cold at the same time to make sure all air is cleared from the lines, then shut them off. Now go back to the tank and turn back on the power to the tank, or turn on the gas to the tank, depending on if you have an electric or gas hot water heater tank. 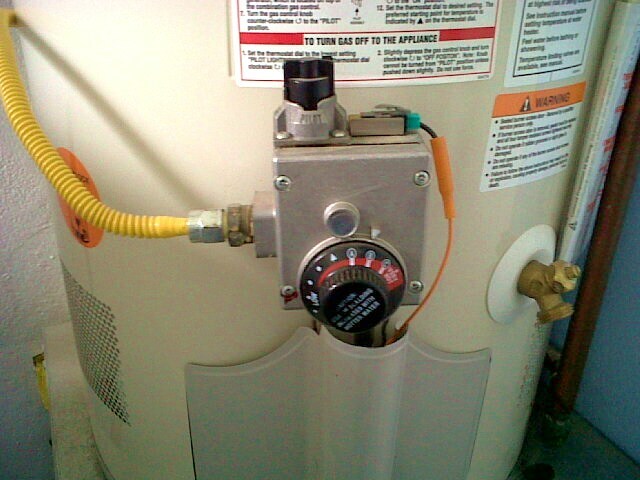 On a gas hot water heater tank or electric, follow the instructions on the front of the tank to re-light the pilot light, or turn on the electric element. (pictured below) You will need to light the pilot light in order for the flame to ignite to heat the water inside the tank. Once you have followed all the instructions on the tank to relight the pilot light and turned the valve to on, your done. It will take about an hour to be back to having hot water again in the house because of heating time. Sometimes I like to wash my truck with warm water in the winter time. So I hook up the garden hose directly to the hose bib on the hot water heater tank and wash my truck with that water. Sort of killing two birds with one stone, I get a clean truck, and the sediments in the tank are flushed out. This should only be done after the maintenance procedure is followed to drain the tank completely as described above, not as an easier solution. 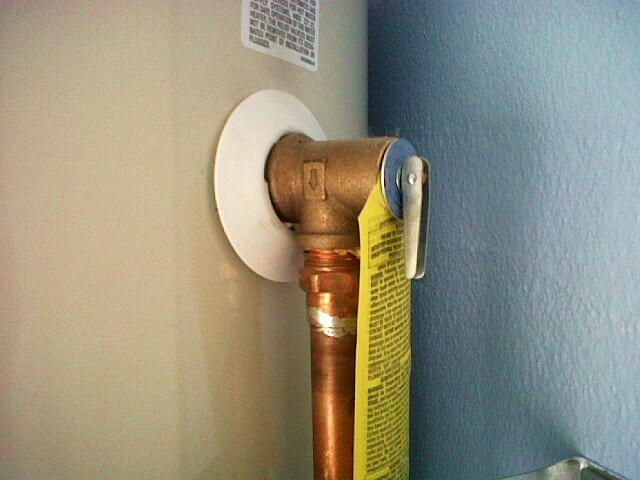 When I change out a hot water heater tank, I change out the shutoff valve to a 1/4 turn shut-off ball valve. The older gate valves I have had problems with leaking just as soon as I try to turn it off. I also replace the water supply lines too, because of age, a lot of the time the old water supply lines leak. Hot water heater strapping is required in California. Follow the instructions on the strapping packaging on how to install properly. Most hot water heaters made today do not require a water heater blanket, but check the manufactures instructions to see if this is the case with your new hot water heater. Hot water heaters today are more energy efficient than older hot water heaters, saving money on your energy costs. 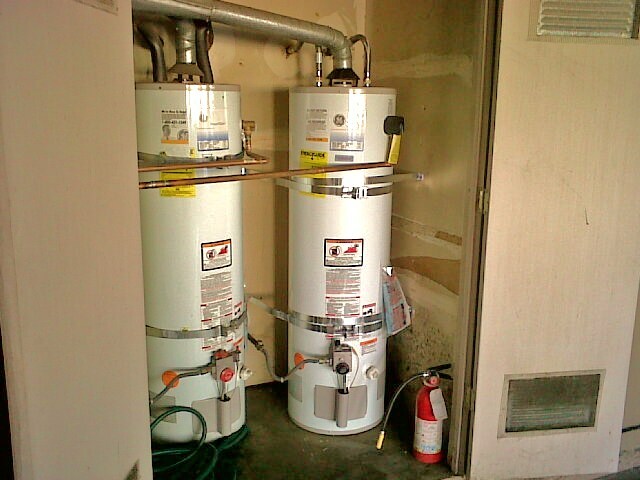 Some people have even changed out their old water heaters to tank-less water heaters. These are more of an on-demand units, using only the energy demanded to heat water, instead of maintaining a tank full of water to be a certain temperature. These units are more costly than a standard hot water heaters, but in the long run it will save on energy costs, and maintenance. 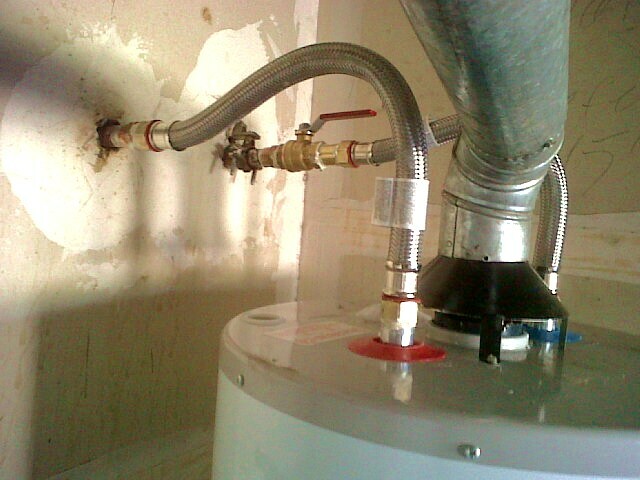 I also recommend installing a re-circulation pump on hot water heaters on larger homes. This will help with getting hot water to further locations away from the hot water heater, that normally take a long time to get hot water. Again, check the Manufactures instructions on how to install. Update: In California the natural gas hot water heaters are now phased out and have been replaced with, Natural Gas Ultra Low NOx Water Heaters at a cost of $100 more than the old original version.